July in the Southwest Angle was fun. Management and Alssa had "Annie" play practice nearly every evening and other activities were plentiful on the weekends. Summer is in full swing. Management gave me the task of taking Alyssa into Warroad Tuesday night last for the first “Annie” practice. While the music director took the orphans through their songs, I escaped to The Point and stopped at the new Trading Post. Since I’d heard that a Warroad Custom is having an ice cream cone at the Trading Post, I decided that was the thing to do. A waffle cone filled with ice cream tagged with three names, I forgot the other two but the middle name was Carmel, filled the bill. I walked outside and over to the east veranda to eat the ice cream cone. It was pretty doggone good. I struck up a conversation with the pair of skinny guys that were expertly putting up some treated pine railing under the veranda. The guys were Jon Cole and David Johnston; when they told me about how hard wives Angie and Michelle were working them to get the building ready I could see why they were so skinny. I didn’t feel sorry enough to offer them any of my cone; figured they could get their own. The railing is just the right height for leaning on to look over the park and lake. There was lots of activity. Roller bladers, swimmers, skate boarders, boaters, fishermen, they were all out that night. After chatting with the guys for awhile and enjoying the Point atmosphere, I went back to the school, picked up Alyssa and headed home. The little girls really like the playground at The Point. They’ve been there several times this week stress testing the playground equipment. Management has plans for them to test out the recently opened pool as well. I felt right at home as we drove up. An older John Deere that had seen better days was in front of the barn and a rusty Ford 4x4 pickup was tucked in the weeds. There is an amazing amount of plant life around, exotic and otherwise. We went inside and toured the greenhouse complex. I picked out several different plants to fill in some of the vacant parts of the garden and Allan did likewise. I met Tammy and she attempted to summon Lou the Lead Honker. It took awhile. In the meantime, Tammy sold me some garden stuff and threw in a couple of flowers for good measure. Lou made the scene and chatted with Allan for a bit, helping him solve a cutworm problem. Sounding just like he does on KQ92, he told me that the greenhouse was his 32 year old 4-H project. Some project. Since we came home via Badger, Allan bought me lunch at the Twins Corner Café. It’s a sleeper, plain on the outside but neat inside with a bright red ’57 Chev front end hanging on one wall and the checkout counter made from the rear end of the same. Along with lots of other memorabilia from the fifties tastefully arranged around the café, the food and service were good. I eventually got the family loaded into the Buick that evening and over to Warroad Elementary for the Broderna Truck concert. We all enjoyed it, a couple of the little girls cavorted around the dance floor for several of the numbers and Management dragged me out for some polkas and waltzes. Well, she probably didn’t drag me out…Mental note: practice a little at home before going out to dance in public. It looks like the mayor might want to consider taking some ballroom dance classes; Ed Bradley was cutting up the floor pretty good with Loralee. Norbert and Jean Bragg were down from their undisclosed location in Canada for the concert and introduced themselves to Management and me. Jean is related to the Pearson clan from Falun. The next morning, we visited the Warroad Baptist Church and listened to Pastor Stoll expound on some Sermon on the Mount precepts. We conversed with the folks there for awhile. Among others, I met car enthusiast Jim Cratty and extracted from him a promise for a ride in his Model T.
We headed the nose of the Buick over to the Care Center for the block party. It was pretty full up with lots of people enjoying the sunshine, fellowship, newly painted facility and the food, not necessarily in that order. John Michael said that wife Denise had cranked his arm pretty good to get him to barbeque the hamburgers and brats for the event. He didn’t have any bruises and neither did Gerry Hitner who made the same claim so party organizer Denise must have kept her powers of persuasion within reason. Jody Cole, Tammy Cole and Kim Calder made for an attractive set of servers. Rumor is that they were also responsible for the original idea for the party. Each blames the other and further investigation appears to be a blind alley so unless any new leads surface, we’ll leave it at that. A great week in Roseau County, see you next week! It is very interesting to see what difference three days makes. We went to lower Northern Minnesota Thursday night for the “4th” weekend since it was a rare opportunity to meet with the three older kids. When we left, the Roseau County wheat fields looked pretty good, but they still looked like fields of grass. When we came back through the fields on Sunday night, they looked entirely different since the wheat had started heading out. Amazing. I guess, however, that some of the more technical people call it flowering, but us agriculturally challenged call it heading out. Before we left Thursday night, I went over to Trapper’s to check in. Trapper was just coming out of the shower. Yes, he does shower sometimes. He sat down at the table and mentioned that he’d raked and baled up 85 round bales that day. A good reason that I try to keep my mouth shut (with marginal success) when he talks farming. Back on my little Hill City swamp farm, I’d start haying sometime around the 4th of July and around the first of September I’d hit a hundred bales if I was lucky. I had several fields rented, mostly small, odd shaped spots surrounded by forest. By the first of November I’d be, say, maybe at the 200 mark, again, if I was lucky. Trapper’s operation is quite different than I’m used to. I’m delegated to using Skiddy to smooth the driveway. The garden is progressing. Trapper lent me his tiller and, after rebuilding the carb a couple of times, it actually runs pretty good. To say the carb was a little gummed up is an understatement. He said he’d just used it last year, but then he thinks the tornado was last year, too. Or maybe it was the flood… Tilling eliminated the weeds between the rows. I’m gradually pulling the weeds between the plants as soon as I can figure out the difference, it’s tough sometimes. The transplanted plants from Honker Flats are taking pretty well even though they haven’t gotten the attention they deserve. I’ll have to go there a little earlier next year. Management and Alyssa both got parts in “Annie” so the Buick is burning up the road between Roseen’s Corner and Warroad almost nightly. The Library provided us a video of the play so all the little girls are singing the songs. It’s some good music so I’m looking forward to seeing the play for more than two reasons. Old Timer Orlin Ostby is now well into his trek down the Pembina Trail. While the modern technology of computers and cell phones haven’t been reliable for him, the old technology of an ox and a cart are moving down the trail. Orlin’s cell phone did work well enough for a three minute conversation, I found out Tuesday morning that he was just west of Thief River Falls. I think I’ll see if Trapper wants to go on a quick field trip to see the old Norwegian and his 2500 lb. ox in action before he gets too far away. One of our family traditions is to run in the 4th of July 5 K race in Hill City. I used to do it, but with weight gain and sore ankles, I let the younger ones and Management take over the tradition. This year son Travis and daughter Heidi carried the family banner. Travis almost didn’t, he’d crashed his motorcycle two days before the race. The cycle, one of those Yamaha café racers, was heavily damaged and Travis had a goose egg sized bump on his ankle. Undeterred, he ran the race and finished in a little over 19 minutes. Oh, to be young and tough again… Alyssa wanted to run but hadn’t practiced. Maybe at the Yellow Rose 5K, Management says. They say you live in the exploits of your children and I guess I’ve just proved it. I figured more wet weather was coming. I know I haven’t lived here as long as most of the rest of you, but last year, right after the army of swathers started attacking the bluegrass fields, the monsoons hit. This year is no different. Almost as if on cue, soon after the bluegrass massacre started last week, the rains came again. Trapper wasn’t happy, he doesn’t have any bluegrass but his haying operation is pretty much on stall. He is able to move bales off some of the fields, very carefully, one by one. Trapper invited me along on a road trip Saturday morning to survey storm damage. I was at work and hadn’t known about the storm with severe winds that went through on Friday at 5 PM. Trapper said, “We’ll just go ‘round half a block.” I didn’t know that in Falun, “going ‘round half a block” means an 18 mile road trip. He had an ulterior motive, as usual. We did see some fallen trees, but the one stop of the trip was to survey one of LaRae’s weedless gardens. Not only was it immaculately kept, the potatoes were nearly as tall as my corn. I guess Trapper, after seeing my weed challenged garden, figured I needed to see how it was done. Trapper stopped by the other morning with a box of strawberries from one of the local strawberry farms. Some of them were almost as big as crabapples. He’s talking about a trip to Beltrami for blueberries. He tells us that when picking blueberries up in Beltrami, one must perfect this move: pick 3 blueberries, eat one, throw 2 in the pail and swat a mosquito, all in one motion. Kinda the same thing I do at dusk in the garden when picking lambsquarters except for the eating part. Management shooed the little girls and I out of the house Saturday about noon and we escaped to Fertile, MN. I’d never been to Fertile, MN. Orlin Ostby is traveling the Pembina Trail and said he’d stop with Pum in Fertile over the weekend. When we got to Fertile, we discovered that the Polk County Fair was in progress. Figuring that was where they would be, we tracked them down and found that the monster Ox was a huge hit. Orlin’s son Christopher was having a good time lifting the kids up to sit on Pum’s back, probably because some of the “kids” were very cute teen-aged girls. On Sunday morning, Management and I decided to take the girls to the Assembly of God Church just west of Warroad. It is a nice little church with friendly people. Praise leader and fill-in pastor Jessie Behm gave a good sermon about appreciating the small miracles that often occur to us. After church, we stopped at Doug’s and Management bought some bread and sandwich meat for a picnic at the Point. The little girls really love that place, another session of stress testing the playground equipment. The 30-some mph winds were keeping most of the boats off the lake although I did see a couple of them carefully navigating the whitecaps. Later in the day, Management, the girls and I watched “Murder Once Removed” at the mini-theatre. I almost thought a couple of celebrities had come to town. The male lead, Robert Baril, could almost have doubled as our governor, Tim Pawlenty. The female lead, Kelly Schaible, has more than a passing resemblance to Valerie Bertinelli. The play was done well. Go and watch it; you shouldn’t be disappointed. A few weeks ago, neighbor Allan Kukowski hooked up Snip and Snap, his giant Percherons, to his covered wagon and brought it over to Trapper’s house. The occasion was a visit by Theodore and Lucille John from Germany with their son Thomas. Theodore had come over from Germany years ago to manage a farm near Badger and ended up marrying the schoolmarm. He’d also hired Allan to work on the farm for several years. At some point, he migrated back to Germany but came back for a visit this summer. David Johnson had brought them out for the evening ride. A thundershower made the 2 mile ride more than a little interesting. Allan and the horses had to contend with the downpour, but the cover on the wagon afforded a sort of protection for the rest of us. We didn’t get too wet and the mixture of thunderclouds and blue sky was ruggedly beautiful as the horses stepped smartly along through the raindrops. I think that all involved enjoyed the ride, but then I didn’t ask Snip and Snap. After the ride, it was coffee and cobbler courtesy of Trapper’s Missus. Last Saturday morning, it was another “round a half block” trip with Trapper. We started out to visit Kirby the logger north of Salol but he’d evidently heard we were on the loose and left before we got there. Since we were in the area, we trekked over to visit Duane Comstock. After that education on the art of putdown from the master, we made our way over to Vollville. I know it’s a real place, it’s on a sign in Henry Voll’s yard. Though I’d heard about Henry, it was my first time meeting him. Henry is a school bus driver. Most bus drivers that started driving 55 years ago are former bus drivers but Henry is still driving. He and wife Loretta were preparing to leave for the all school reunion at Salol. Henry was obviously happy for the opportunity he would have see former riders he hadn’t seen for years. Management took the little girls to Grand Rapids on Thursday for their Showboat gig. Management played piano and the girls sang two numbers; “Catch a Falling Star” and “Do Re Mi”. They appeared in the show Thursday and Friday night and were the pre-show act on Saturday. Since the weather wasn’t conducive for making hay, Trapper and the Missus took me over on Saturday to watch the show. My sister directs the variety show held on the banks of the Mississippi. 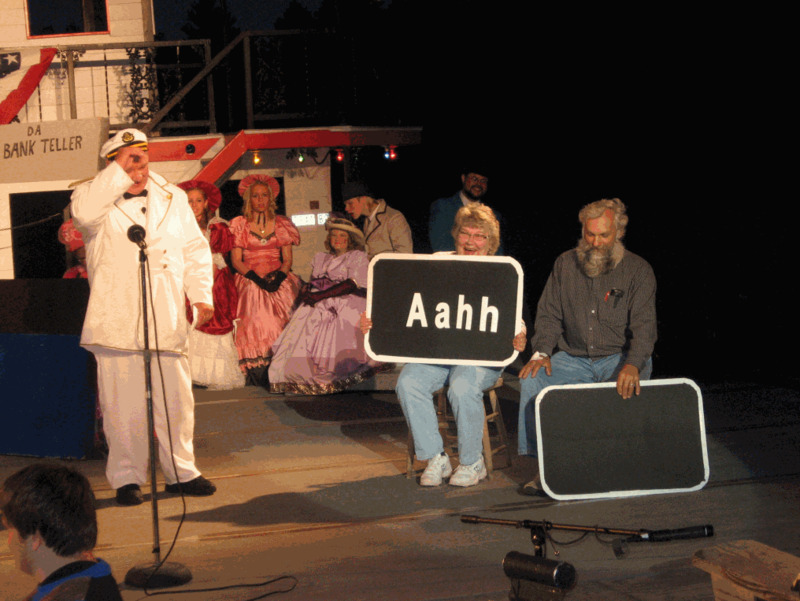 The cast performs a melodrama at one point in the show and they pick 4 people from the audience to hold “boo”, “hiss”, “aahh” and “yay” signs for the act. For some strange reason, Trapper and the Missus were two of the lucky people chosen for the sign holding task. Gary Johnson stopped by one morning this week for coffee, and after hearing about Trapper’s performance and seeing the pictures I took, was wondering out loud if Willie Nelson had to be worried about Trapper taking over his spot. I’m of the opinion…no, I think I’ll leave that one be. By the way, congratulations to Gary and IdaMae for being finalists for the Minnesota “Tree Farmer of the Year”. I’m planning on taking my old John Deere A to the tractor pull at the Roseau County Fair. I’ve done some tractor pulling in my long ago past and hope to remember some of the finer points before I hit the track. My preparations are simple: make sure it starts and runs. It hadn’t done anything for a couple of years so when I started it up this spring, it didn’t run too well. I think I’ve figured out which carb jet does what and after some careful adjustment it runs better than it did. Still lopes a bit at idle so I’ll just tell anyone that asks that I’m running a hot cam in it. That explanation worked when I had a stock car so why shouldn’t it work with a John Deere? I took daughter Alyssa to Church Night at the Roseau County Fair on Sunday night. It was a very nice service. The Zion Worship Band did a good job on the musical part of it. While some of the music may have been different than some are used to, it was still Top Shelf Stuff. Some people are very versatile. David Landby was running the sound board for the Broderna Truck concert the last time I saw him; he’d swapped that for a bass guitar for the fair service. The skits about how we err as Christians were good. Thanks to all involved in this endeavor. One thing about getting older is that the memory seems to be getting a little bit faulty. I’ve seen and done so many things this last week that I figured I’d have plenty of material for this column. I distinctly remember telling several people, “that’ll make the paper”. Now that I’m sitting at the keyboard and the deadline is staring me in the face, I simply can’t remember a thing. Enough of my problems. I’ll attempt to meet the deadline and dredge up something out of the spider-webbed archives for this week. I think I have to give an uncharacteristic apology to the residents of Warroad proper for causing their mayor a bit of distress. Regular readers will remember that I have a dog, Abby. Abby has decided that I’m her human and she must be with me at all times if possible. She usually is, so Tuesday last when I loaded up the Slant-dash A John Deere to go to the tractor pull, she jumped in the pickup along with the Little Girls to ride along. About 2 miles down the road, I realized that it would have been better to leave her at home but I was running too late to take her back. We got registered for the Pull just in time to walk across the field to watch the parade. About the 5th or 6th unit was a beautiful classic red Pontiac convertible with “The Judge” emblazoned on the fender, driven by the lovely and gracious Loralee. Her passengers were Uff-Da and Mayor Bob. Following their completion of the parade, Loralee pulled up beside us and backed “The Judge” in beside us. Abby is a jumper. She also is enthusiastic about greeting people once she’s barked at them. When Uff-Da, sitting on Bob’s lap, poked her head over the side of “The Judge”, Abby barked at her, then ran toward the car for the second part of her repertoire, a friendly jump. About this time, Bob got a helpless look on his face and yelled something at Abby. I yelled something at Abby and made an uncharacteristically quick lunge at her and grabbed her collar as she jumped at the door of the car. Fortunately, there was a sign on the door where her paw grazed it. Loralee said that Bob is still recovering, but OK. If you see him, you might want to tell him I’m sorry, I’m not sure if he’s ready to talk to me yet. Made a bunch of money by going to the tractor pull. It cost $10 to register and they sent me a $15 check because they said I took first place in my class. Let’s see, after paying for gas, that’s…oh, maybe I’d better try that again, only different. I grossed $15 by taking my Slant-dash A to the tractor pull. That sounds lots better. The Fish Fest on Saturday between Riverside Bait and the Warroad River was the place to be. The Boy Scouts were beneficiaries for the proceeds of this “Top Drawer” event. The weather was perfect and lots of people showed up to feast on walleye. The competition appeared to be intense for the event. I tried to take lots of pictures. At one booth, the guys were so intense on cooking and serving their secret recipe walleye, I never did see their eyes, just a couple of hat brims. That wasn’t the case down where the 4-Wheelin’ Girls Rock team was dishing up Cajun Walleye. I couldn’t really taste the walleye; their camo-pink t-shirts were so bright my taste buds were affected. I gave them my vote for their enthusiasm. They were just plain having good, clean Warroad fun. I rate events by how long it takes the Little Girls to come and ask me when it’s time to go. At this one, I had to look them up and pry them away from the games, fish and free Root Beer Floats. I saw Julie Jones at the Fish Fest and begged to watch a dress rehearsal of “Jungle Book” so I could wedge the pseudo-review into this week’s “Pioneer”. She assented, so Katelyn, Valeri and I were at the mini-theatre on Sunday to peruse the play. Lots of kids have a great opportunity to experience the stage side of theatre with the Popcorn Players. You can read the pseudo-review elsewhere in the newspaper. While I was heading home after the rehearsal, I was thinking, dangerous, I know. I think I’ve come up with some guidelines for the people of the Southwest Angle. Here goes. As a rule of thumb, if you are an acquaintance of the cast member of a local community production, the minimum number of performances you are required to see is 1. If you have a niece or a nephew in the cast, the minimum is also 1. If your son or daughter is in the cast, come at least twice. For a grandfather, again, twice. The expectation is that the doting grandmother will attend each performance. Remember, these are only minimums, the Popcorn Players will appreciate it if you exceed these. As a caveat, this rule only applies for those within reasonable commuting distance. I hope I’ve helped you all out with this one.